One truism of modern technology is that everything gets smaller. Computers used to fill rooms. Hard drives that stored an incredible 5 megabytes of data were the size of refrigerators. Cellphones used to be the size of a military walkie-talkie. Thumb drives, also known as flash drives, or memory sticks, used to be the size of, well, your thumb. But that’s no longer the case. 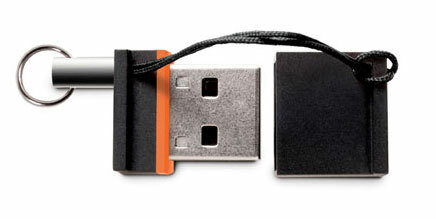 LaCie’s MosKeyto makes the average thumb drive look as big as Shrek’s thumb. Its the smallest thumb drive I’ve ever seen. The Weeks Division of MyMac Labs gave the 4 GB version a good workout. Measuring .83 inches x .63 inches x .4 inches, this thumb drive is closer to the size of your thumbnail than your thumb. It weighs .35 ounces, or a mere 10 grams. I can barely feel anything when I hold it in my hand. If size matters, then why the small size? Most thumb drives stick out well over an inch from the side of my laptop, and it’s just waiting, no it’s asking, to be broken off. The diminutive MosKeyto extends only .4 inches from the USB port, so it’s almost impossible to bang it, whack it, or smack it with some other object. 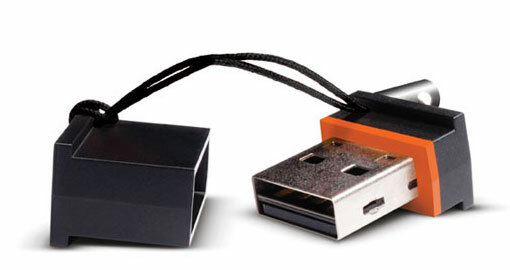 This allows you to leave the MosKeyto plugged in for long periods of time without worrying about breaking it off. I had no concerns about sliding my MacBook Pro into its close-fitting Brenthaven bag with the MosKeyto attached. I would never do that with a traditional thumb drive. LaCie includes a small (too small, actually) lanyard with the MosKeyto, to help prevent it from being lost. The flash drive is so small I actually had a hard time threading the lanyard through the microscopically small hole in the drive case. I needed a pin to push the lanyard though the hole. I’m seriously considering painting the MosKeyto a bright orange to make it easier to find. The MosKeyto comes formatted for Windows computers. While Macs can read and write to Windows-style FAT32 volumes, if you plan to use the MosKeyto only on Macintoshes, you may use Disk Utility to repartition the MosKeyto to one of three Mac-friendly formats. I repartioned the drive as a GUID volume. The MosKeyto has respectable performance. I tested it with XBench 1.3, and found that the MosKeyto cranked out an average write speed of 3.4 MB/sec, and an average read speed of 12 MB/sec. In comparison, my MacAlly combo battery/thumb drive had an average write speed of 2.0 MB.sec, and an average read speed of 9.7 MB/sec. LaCie includes a free subscription to Wuala, an online “cloud” file storage service. 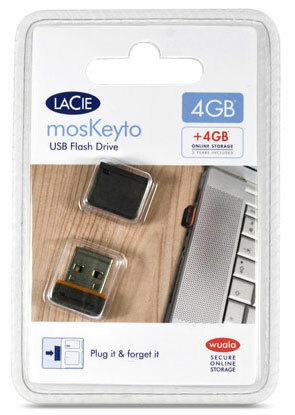 With the purchase of a MosKeyto, you get 4 GB of online storage space. Access to your account is via a Java application, unless you elect to install MacFUSE. MacFuse allows the Finder to display the contents of your Wuala drive. I did not test Wuala, and I would not recommend buying the MosKeyto because of a free 4 GB of online storage. There are many free online storage providers to choose from; I’m very partial to Dropbox. Conclusion. The LaCie Moskeyto is a miniature USB flash drive that is more than small. It’s tiny. It won’t catch on things, or get broken off. You can travel with it attached. It performs well. I highly recommend it. My only complaint is that the lanyard is hard to connect. If the MosKeyto was any smaller, it’d be too small!